The 'Drifts of Grass' area is elegant and placid, and despite, or more probably because, only Molinia 'Poul Petersen' is used, it is intensely satisfying. Since it opened in 2004 the Walled Garden at Scampston has become one of England's most noted modern gardens, so was a natural choice for an early visit in my tour of Yorkshire gardens. Another incentive is that it is less than six miles from here, perfect for a Sunday afternoon outing. Scampston Hall has been in the same family since the 1690s, and as the brochure remarks, they have 'employed some notable gardeners', starting with Charles Bridgeman in the 1720s, moving through Lancelot Brown, and most recently Piet Oudolf. It is the Oudolf creation in the walled garden that has won the plaudits, and one can see why. It is a large space divided into ten separate garden areas, each of which is amply spacious and well-proportioned: although each can stand alone one leads harmoniously into the next, usually through the immaculately clipped hedges that provide the element of continuity. I found it to be truly delightful. The 'Perennial Meadow' is the heart of the garden and resplendent at present with carefully chosen perennials and a smattering of grasses. Echinacea pallida, with a magenta Monarda behind to irritate Mark Brown: but there are no screaming yellow and magenta combinations here! A Syneilesis growing in the Plantsman's Walk - a cunning device to bring one into the heart of the garden unexpectedly, at the further end from the ticket booth. A broad border with interesting planting against the wall is edged by a path, itself bounded by a dense screening hedge. The Serpentine Garden seen from The Mount, which reveals the garden as a whole rather than as the rooms passed through at ground level. It seems that the other garden areas at Scampston Hall have only been opened to visitors quite recently. They may lack the spectacle of the Walled Garden, but are well worth exploring on the Cascade Circuit Walk. This takes one through the parkland and gardens adjacent to the house, to explore the older landscape that surrounds the house; after the continental gardening inside the wall it all becomes very English once again. The Palladian Bridge spanning one of Capability Brown's lakes. Scampston Hall looks out over a broad expanse of parkland with some fine trees. The diversity of tree shapes, textures and colours in the central part of the arboretum. I've now been in post as Director of the Castle Howard Arboretum trust for two weeks, which have flown by as I try to get know and understand the place - and the people who make it happen. It has been fascinating, though I'm sure I'll need to ask the same questions several times before all the information I've been told sinks in. There is a great deal to know about a place this size - though even the size of the arboretum is not entirely clear to me yet! Some say 130 acres, others say 150, but it is certainly large and rather lovely. In addition to the Arboretum proper there is the smaller area (about 20 acres) of Ray Wood, situated adjacent to Castle Howard, in which the trust has the responsibility of maintaining the collections. In future I will write more about these areas, and their collections, but these are a few annotated photos taken in the past fortnight. Hydrangea paniculata under the high tree canopy in Ray Wood, part of Jim Russell's original plantings from the 1970s. Jan Hoyland, who is responsible for the rehabilitation of Ray Wood under funding from the Monument Trust, with volunteers at the end of another day clearing overgrown laurels. The trust is heavily dependent on volunteers for many aspects of its activities. Dr Paul Evans of Buglife: the Castle Howard Arboretum is a partner organisation with Buglife in an ambitious project to restore permanent, biodiverse lowland meadow vegetation to various sites in North Yorkshire, which should bring a lot of interest to the currently rather dull arboretum grassland. More info on the B-Lines project is available on the Buglife website. A grove of Metasequoia glyptostroboides: the arboretum is large enough to enable generous groups of trees to be planted. Sata Pond - a natural wetland of great interest. A cone of Picea purpurea. 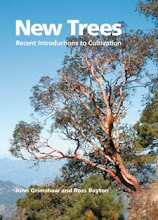 My colleague and co-author on New Trees, Ross Bayton, has alerted me to the availability of an important job in the horticultural press, that of Gardening Editor for Gardeners World Magazine. It's actually Ross's current job, but he is emigrating to Seattle with his partner, so the vacancy has arisen. Information on the post can be found here. The tremendous display of hardy perennials in the Lawned Garden at Breezy Knees. To start my visits to Yorkshire gardens I decided yesterday to visit Breezy Knees Garden and Nursery at Warthill near York. 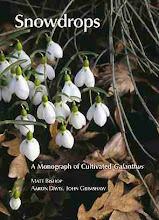 I had heard good things about it locally, and its praises were sung at the Shropshire Hardy Plant Society meeting where I spoke on Saturday: it was also written-up by Roy Lancaster in the June 2012 issue of The Garden. As my reading has been somewhat interrupted of late I hadn't seen that article, but it is conveniently available as a pdf here (goodness knows where my hard copy is!). As recounted by Roy, Breezy Knees was started in 1999 by Colin and Marylen Parker, on an ex-farmland site in the Vale of York, on rather sandy soil and exposed to wind and cold. The garden now covers about 14 acres, and is composed of a series of garden spaces with different characters. This gives space to grow an incredible diversity of hardy perennials, with some woody plants. They claim to grow 6000 varieties of perennial and I can well believe it, though many are present only as single clumps. The result, at this time of year, is a brilliant display of colour. It is all immaculately kept, with scarcely a weed to be seen, the result no doubt of the use of weed-suppressing fabric and bark mulch on an industrial scale. Unfortunately, however, someone has a straight-line fetish and the perennials are planted in the beds in straight lines. The effect is distressingly inartistic, suggesting a nursery stock bed or trial ground, and the use of prominent wooden edging boards round every bed does not help. The brochure states the belief that 'gardening is all about plants, not hard landscaping' - but they really need to come together with sensitivity to make a beautiful garden. Despite this lack of artistry, Breezy Knees is a remarkable place. As a demonstration ground for what will grow well in these conditions it is superb - I know nothing like it anywhere else in this country - and I have no doubt that I shall return there quite regularly to study the collection. Regrettably, the perennials are planted in straight lines throughout the garden. Phlox 'Starfire' with a pink Veronica. The very elegant Sanguisorba 'All Time High'. The Breezy Knees nursery stocks a huge range of perennials, grown and displayed on raised benches, sustained intelligently by flood irrigation. I suspect I shall be acquiring a lot of plants from there. After a horrible day packing and loading on Thursday, I arived at my new home in Settrington, North Yorkshire, just after midnight on Friday: the removals van got here at 10.30 yesterday morning and another few strenuous hours ensued. By this afternoon, with essential furniture established and shopping done, I could turn to the garden. It's smaller than at Colesbourne, but still a decent size, with a southerly aspect and a nice light loam soil﻿. The garden has not been worked for a little while, it seems, but was made by a lady who contributes occasional words of horticultural wisdom through the pages of The Garden. There are some curiously impractical aspects, and the palette of plants flowering at present is rather too tastefully pastel for me, but there are some good things worth keeping. Most interestingly, it's evident from the vigour of plants such as Euphorbia × pasteurii, Eryngium agavifolium and Geranium robustum that the climate is certainly no colder than at Colesbourne. It is going to be fun to make a garden here. Settrington is at the northern edge of the Yorkshire Wolds: looking south from my bedroom. Pastel shades predominate in the main border, with Salvia sclarea prominent. First tack was a hack-job mowing of the long grass , followed by a couple of vigorous hours with the slasher to cut down the worst of the weeds. A curious feature along the drive is a row of poles with things atop them, rather too suggestive of Mr Kurtz to be nice. They will not stay there long. First and last view of the cottage. After seven years of living and making a garden here I move to Yorkshire today. It is of course painful to leave so much behind, but new opportunities and possibilities await, and the creation of a new garden is always fun. PIctures from yesterday afternoon. Now I must finish the packing! A large part of my plant collection is packed into a rental van, ready for the journey to Yorkshire tomorrow. Probably the most biodiverse space on the planet! The empty shelves on the trolley are now filled too. 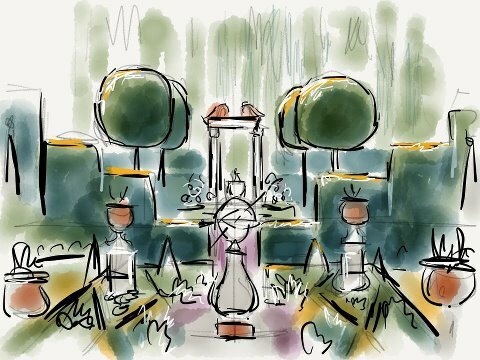 The Pierrepoint Morgan Rose Garden at The Laskett, drawn by Guy Combes on his iPad. The Pierrepoint Morgan Rose Garden, viewed from the opposite direction. I bunked-off from the horror of packing today to join my artist friends Guy Combes and Andrew Denman in a visit to Sir Roy Strong's garden at The Laskett in Herefordshire, kindly arranged by Jonathan Myles-Lea. Jonathan, in addition to his painting and poetry, is responsible for the attractive and informative website for the Laskett Gardens. The garden was started in 1973 by Sir Roy and his late wife Dr Julia Trevelyan Oman on a field surrounding the Victorian house. It has evolved continuously and has earned itself a place in the pantheon of contemporary British gardens. Unlike most, however, it is deliberately and effortfully a formal garden, relying on strong shape from (especially) hedges, topiary and hard landcaping, with a selection of statuary and other ornaments. It's the garden of a would-be Renaissance prince, built on a budget, and often celebrating the achievements and interests of its creators; the result is a uniquely whimsical confection. Splendidly and stiffly formal - the Elizabeth Tudor Walk, with tiers of hedges. Variation in colour and texture from the hedges - pleached lime, undulating beech, tight-clipped yew with holly standards, and yew columns. Though there are some nicely planted areas, as here in the 'Serpentine', in general the 'soft' planting does not live up to the strength of the design. The view to the Victoria & Albert MuseumTemple. Sempervivum in an urn in the Silver Jubilee Garden.